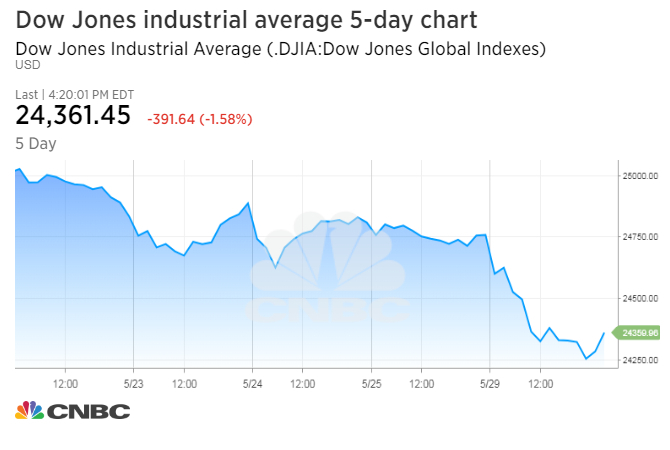 The Dow Jones industrial average fell more than 500 points at its lows as Goldman Sachs and J.P. Morgan Chase led the index lower. The euro fell below $1.16 — its lowest level this year against the greenback — as Italian debt rates continued to rise. The Stoxx Europe 600 fell 1.4 percent, weighed down by a 2.5 percent drop in Italy's FTSE MIB. U.S. stocks sank Tuesday amid political turmoil in Italy that sent the euro tumbling and ongoing difficult trade talks with China. Bank stocks led the decline. Tuesday's losses marked the third straight trading session of negative numbers for the Dow and S&P 500, both of which suffered their worst day on a percentage basis since April 24. Stocks extended their losses throughout the day as European exchanges closed and the euro fell further against the dollar. Concerns about a global credit blight and anemic interest rates appeared to weigh on U.S. financial stocks Tuesday, sending shares of the nation's largest banks tumbling. Goldman Sachs, J.P. Morgan, Citigroup, Morgan Stanley and Bank of America all lost more than 3 percent. The Financial Select Sector SPDR (XLF) exchange-traded fund fell 3.34 percent, below its 200-day moving average. Banking investors could be nervous that a decline in global credit could lead to collateral damage to holders of international bonds, though widespread strengthening in global government debt Tuesday also dampened the banking outlook. "The more recent bout of political turmoil spanning across a number of member countries coupled with a clear loss of economic momentum in the region has investors questioning the sustainability of the recovery and the future of the bloc," Lindsey Piegza, chief economist at Stifel Nicolaus, wrote in an email to CNBC. The Cboe Volatility Index (VIX) — a measure of market anxiety — rose to highs above 18. U.S. stock markets were closed Monday for Memorial Day. The risk-off attitude fueled demand for safer asset classes, including U.S. Treasurys. The rate on the U.S. 10-year note fell to 2.77 percent Tuesday, down from highs above 3.1 percent in recent weeks. The Stoxx Europe 600 fell 1.4 percent, weighed down by a 2.6 percent drop in Italy's FTSE MIB and a 2.5 percent decline in Spain's IBEX 35. In Asia, stocks finished the session in the red, as the euro zone's political turmoil depressed markets worldwide. The euro fell below $1.16 — its lowest level this year against the greenback — as Italian debt rates continued to rise. The Dollar Index, which pits the greenback against a basket of currencies, was up 0.68 percent Tuesday at 94.83. Exacerbating banking sector woes was J.P. Morgan Co-president Daniel Pinto, who revealed Tuesday that trading revenue in the second quarter will probably be flat from a year ago. "Overall, markets revenue as we see it today will be flat year on year," Co-president Daniel Pinto said Tuesday during a conference in New York. "The core activities will be up let's say mid single digits. Then we have a series of one-offs that overall take that back down to flat." Morgan Stanley, meanwhile, clinched its worst day since June 2016, down 5.75 percent. The slide in the company's stock occurred after an executive cited more challenging business conditions in the second quarter for its wealth management division. Over the weekend, Italy's president appointed former International Monetary Fund official Carlo Cottarelli as interim prime minister to form a new cabinet and restore political order within the country. The euro zone's third-largest economy has been struggling to establish a stable government since inconclusive elections in March, with anti-establishment forces abandoning their effort to form a ruling coalition over the weekend. "In Italy, in the short-run, the status quo prevails, [but] if elections strengthen the hand of populist parties on the left or the right, there's danger of a more radical response," said David Kelly, chief global strategist at JPMorgan Funds. That could be "fiscally dangerous, given how much debt Italy already has." The latest developments have spurred previously dormant fears concerning the stability of the eurozone and default risk concerning Italy's €2.3 trillion ($2.68 trillion) in debt. The 10-year Italian bond yield jumped above 3.38 percent early Tuesday, its highest level since March 2014 and more than 2.5 percentage points above the German 10-year bond rate. Yields move inversely to prices. "I think default risk, however, is still extremely low," Kelly added. "Italy could not possibly default on their debt without an entire collapse of their economy. They would really be defaulting on their own citizens and I don't think it's likely to happen." European worries extended to Spain, where the country's parliament is set to vote whether to oust Prime Minister Mariano Rajoy and his center-right party this Friday. Industrials and materials stocks also sold off Tuesday on fears of slowing global growth due to the Italy crisis. Aircraft manufacturer Boeing and agricultural science developer DowDuPont both moved lower, while the price of oil continued to fall amid reports of increasing output. U.S. West Texas Intermediate crude futures fell as much as 3 percent on Tuesday, posting a fifth straight day of losses after hitting a 3.5-year high last week. The contract ended the session down $1.15, or 1.7 percent, at $66.73 a barrel. Concerns that Saudi Arabia and Russia could boost output have exerted downward pressures on oil prices over the past week. President Donald Trump's administration also said on Tuesday that it will continue to take action on trade with China, just days after the two countries announced a tentative solution to their dispute. The White House said in a statement that the United States will release a list of some $50 billion worth of Chinese goods that will be subject to a 25 percent tariff. The United States will also continue to pursue litigation against China at the World Trade Organization. —CNBC's Jacob Pramuk and Gina Francolla contributed to this report.